Published: Jan. 14, 2018 at 08:48 p.m. Updated: March 1, 2018 at 09:36 a.m. Facing a desperate third-and-10 scenario with 10 seconds left and his team trailing 24-23, Keenum unfurled a rope that found a leaping Diggs along the sideline. The star wideout snagged the ball at the New Orleans 34-yard line, avoiding a diving tackle attempt by safety Marcus Williams to race untouched to pay dirt as U.S. Bank Stadium melted into joy. The Keenum-to-Diggs magic becomes an instant classic in playoff lore, capping a frenzied fourth quarter that saw four lead changes in the final three minutes of play. Lost in the game's wild conclusion was a brilliant second half by Saints quarterback Drew Brees, who erased a 17-0 deficit to craft a one-point lead with 25 ticks on the clock. All looked lost for Minnesota after a pair of Keenum incompletions left the Vikings stuck at their own 39-yard line with nothing left but a prayer. 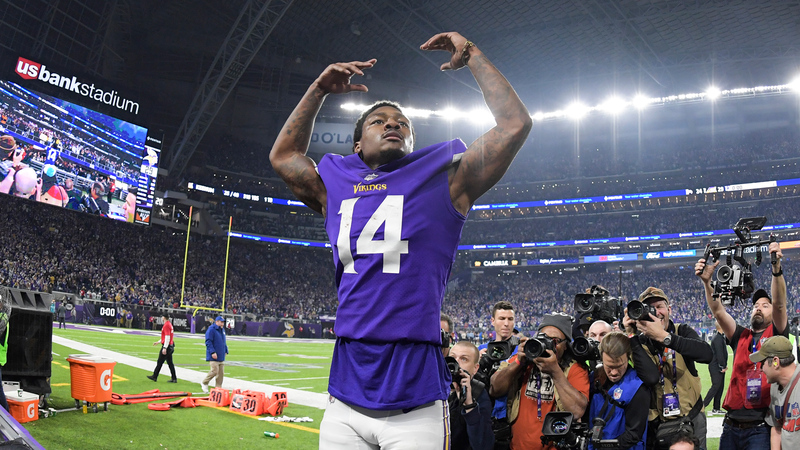 For once, this snake-bitten Vikings fan base saw that prayer answered, with Diggs and his charmed quarterback combining for a play that will never be forgotten in the state of Minnesota.